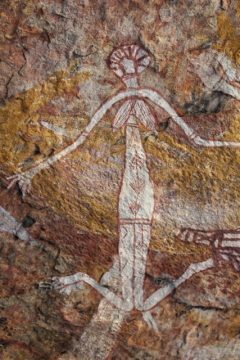 As mentioned, Cynthia will be traveling to Australia for the third time to participate in the burial of the first of the 2nd generation ETVs at the sacred site Gabarnmung at the invitation of Jawoyn elder (her “mumma”) Auntie Margaret Katherine. Few people beyond the archeologists studying the site have ever visited this remote place and we are deeply grateful to Margaret for insisting a vase be brought here, bringing the ancient Gabarnmung – sure to become a world heritage site – into the global ETV mandala. Auntie Margaret Katherine at Gabarnmung. Of all the pilgrimages and places we have been with this practice, we know with Gabarnmung that our work will carry on. Entrance to the Gabarnmung Caves. (The following contains excerpts from Smithsonian Magazine: Is This the Oldest Cave Art on the Planet?). Gabarnmung, or Nawarla Gabarnmung, meaning “hole in the rock”, “passageway”, or “valley open from the centre” is an Aboriginal archaeological rock art site in southwestern Arnhem Land at the top end of Australia’s Northern Territory. 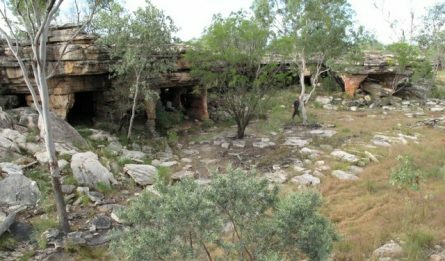 Only accessible by helicopter, this remote location lies on the traditional lands of the Jawoyn people, east of Kakadu National Park. It is here that we will journey over the new moon in June to bury the first of the second generation of ETVs with Auntie Margaret Katherine, the custodial elder and traditional “owner” of vast lands in Jawoyn Country, including Gabarnmung. 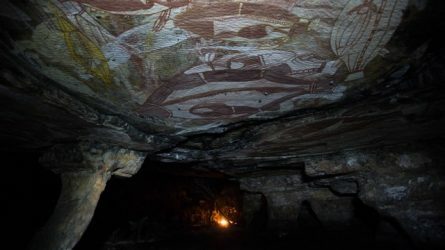 Like the Sistine Chapel, the ceiling of the expansive rock shelter is a mural of breathtakingly vivid and bold works of art – hundreds of them. And the paintings extend up and down 36 remarkable sandstone columns that, like the pillars of a temple, appear to support the cave. The most important thing about the Gabarnmung cave paintings may not be their age or their splendor. It is that the Jawoyn people, the descendents of the ancient civilization that created the works, are still alive – and Auntie Margaret is the living treasure who is informing archeologists about what they have found. We feel so blessed to be invited by her to this most sacred site and to learn from her ourselves. It happened, it really happened. Back at my desk amongst a busy home life, it seems surreal to think back to what occurred just 5 weeks ago – like a fable or a distant dream – but I have evidence to prove that it did happen, memories that spark awe in my flesh. 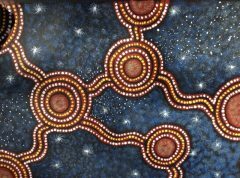 At dawn on the 18th of June 2015, the Seven Sisters (many indigenous peoples say the people physically or spiritually originate from this star system also known as the Pleiades, depicted right) arose visibly for the first time in this solar cycle from Australian soil. 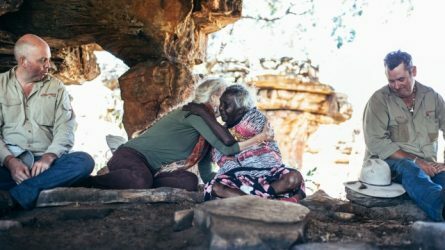 The specific intention I had set for the network of Earth Treasure Vases to be placed throughout Australia is to unite indigenous and non-indigenous Australians, to support the return of indigenous Australia’s ancient wisdom and to be a cause for the songlines to sing their sweet symphony once more. 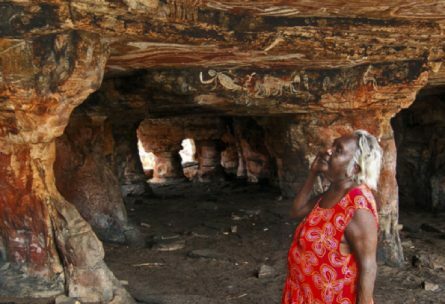 Margaret Katherine (pictured at left) from Australia’s far north, a Jawoyn Elder and the custodian of Gabarnmung, invited us to visit this site under her guidance and decreed the first of the “new” Earth Treasure Vases (ETVs) be placed there. 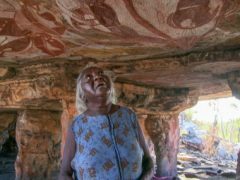 A rock dwelling with continuous human habitation stretching back hundreds of thousands of years, Gabarnmung is home to some of the most incredibly potent stories on its walls, pigment looking as fresh as the day it was painted. From there the ancestors still beam out their blessings and their teachings. Our group of 27 flew into this remote sacred site in a shuttle of helicopters over the vast now-uninhabited land, to Gabarnmung where we would sleep the night and place this ETV in the Earth for eternity. When we arrived, Margaret led us to the place where the vase would rest; she had obviously thought deeply about its placement in the most sacred spot imaginable, the equivalent to placement in the inner shrine. That night after our final ceremony and sealing of the ETV in circle around the fire, we snuggled in a group lying directly on the Earth with her soft sand as our mattress, our toes twirling sand through them that would have been trodden by thousands of ancestors millennia before. After Ben Manbulloo’s bedtime stories, the men retreated to their small fire with the women huddled together around their blazing hearth. At night, our campfire was visible from the Gabarnmung shelter above. I was first up as faint rays of light cracked over the horizon, and checked the path to the placement site, disturbing kangaroos as I walked, who went hopping off through the long grass. Julian gently droned his crystal didgeridoo into the Earth as a wake-up call to the women and ceremonial opening of the day. Slowly our mob’s dream-bodies reunited with their flesh; followed by tidying of bedrolls and brewing cups of tea, in ceremonial silence. In the middle of the huddle was Mumma who did not rise but lay there snuggled and warm, saying, “I’ve shown you where to place it, now you can do it, Bungardi (my skin name as her son).” “Wo, Garang (“Yes, Mother”), I replied. Carrying the ETV I led the group in single file, Cynthia and Manbulloo close behind, and Julian playing the dij to consecrate the ground as we walked. We clambered into the place selected by Margaret that I had dug out the day before and with the group gathered all around, chanting mantras led by Julian, I felt Cynthia’s presence close by channeling a column of light and Mumma palpably holding space for the ancestors back in camp. shed tears upon arriving at Gabarnmung. With the support of this sacred entourage, I placed the ETV neatly in the rock, in a place made to measure, eroded to perfection over millions of years. As I did so, I felt as if the ETV was sucked deep into the Earth, followed by a great heat and heaviness, as if an emissary of Mother Earth had accepted the offering. At the point of acceptance, I felt a flash of light as if the Mimi (protective spirit or guardian angel of this place) had received the blessings contained in the vase (especially that of the Dalai Lama whom we had met at Uluru just 5 days before). Then they soared, united with the blessings straight up into the sky and spreading the blessings over and into every part of Gabarnmung. I was seared by a bright flash of the most profound light….and then it was time to seal the tomb. The group filed round passing rocks to place around the ETV, cocooning it in its forever home. Halfway through, Manbulloo, who will steward the next ETV in Australia, took over, sliding into the opening in the rock, with all present mucking in, the drone of the dij and the chant of Tara echoing all around. 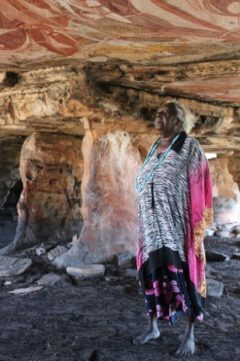 When the deed was done, I looked up to see Cynthia sitting on the edge of the rock face, now a joyous grandmother of a new generation of Earth Treasure Vases. This entry was posted on Thursday, June 18th, 2015 at 5:02 pm	and is filed under Burials. You can follow any responses to this entry through the RSS 2.0 feed.